Figure 1. 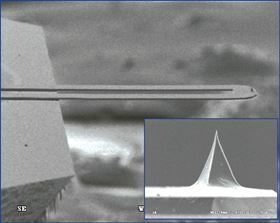 An SEM image of the microfabricated thermal probe used for nTA measurements. The inset is a zoom of the tip, which makes contact with the sample surface. Log in to your free Materials Today account and complete the steps below to download this application note. The VITA module enables nanoscale thermal analysis (nTA), a novel technique that allows the determination of the local transition temperature on the surface of a material with nanoscale spatial resolution. By providing quantitative characterization, nTA can help identify materials and their phase separation and component distribution (or aggregation) at the nanoscale. The technique utilizes a specialized thermal probe to heat a very small region on the sample surface and locally measure its thermal properties, including such thermal transitions as melting points and glass transitions. The thermal probe is similar in geometry and physical characteristics to standard silicon atomic force microscopy (AFM) probes, and thus enables the generation of high-resolution sample topography maps using contact mode and TappingMode™ techniques. The AFM image can be used to target locations of interest for thermal analyses, which can then be executed in a matter of seconds. In this way, nTA marries the resolution of AFM to the unambiguous and quantitative data of thermal analysis. This application note describes the technique and demonstrates its benefits in a number of applications.